..and why the hell not.. one should ask.. ..with the current run on the prices of collector cars, we as a collective have to stop letting our cars be valued so dammed cheap.. .. in my opinion, a good example is indeed worthy of triple its current valuation. 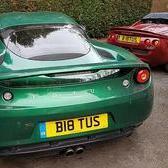 So, from now on, I am going place the value of any Lotus Car I own/ sell at at least three times its present valuation. If we all follow suit, Classic Lotus' valuation will be where it belongs, and perhaps, finally, the marque will develop recognition as worthy collector cars..as they indeed are. Hi Filip... Thx for the input.. That was the conclusion I came to as well.. But since I have no key, I had to work them out by force and juditious use of a pick. Love my '85 Giugiaro S3T.. The engine can handle the boost.. but watch the AFR (minimum 12.5:1) and IAT (anymore than 160Fand your in big trouble.) My advise.. test AFR and IAT on a road dyno before cooking your pistons.. If anyone can help, I am looking for an intake cam cover with the oil filler cap located in the middle or forward to clear the factory intercooler. If you have one pls send me a pm or message on my S3R FB page thx Jan Also.. BTW If anyone needs parts, I have the entire original 84 S3T parts and components available, everything.. less body and chassis .. all in good condition. I would prefer to box it all in one package if I can vs part in bits and pieces.